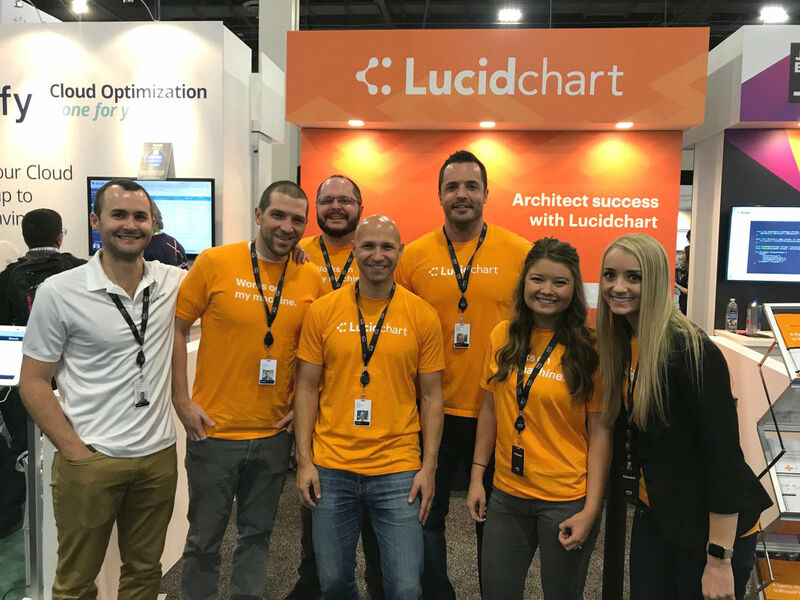 At Lucidchart, we love the chance to meet with our customers and partners, and AWS re:Invent in Las Vegas provided the perfect opportunity for our team to meet users and further understand the AWS ecosystem. The real buzz in our booth revolved around our new AWS architecture import, which automatically lays out your AWS architecture into a network diagram. This feature saves network and systems architects countless hours of diagramming, tracking down information, and hoping that it is an accurate representation of their network. But the Lucidites at AWS re:Invent didn’t spend the entire time working the booth and pitching our product—David Torgerson and Nathan Cooper, engineers who work daily in our own AWS infrastructure, spent their days riding the monorail to keynotes and breakout sessions, learning how they can take Lucid’s operations to the next level. Both David and Nathan explained that, if you’re only going to AWS re:Invent for the sessions, you could just wait for the presentations to become available online (although they were definitely happy to receive more detail about Amazon’s KMS, HSM, and HSA offerings and see Amazon’s future plans for supporting more secure installations). The real value from the conference comes from workshops and discussions with presenters and fellow attendees. As they stood in line for different events, they learned how other engineers dealt with problems we’ve faced at Lucid, including EC2-instance vulnerability scanning across multiple accounts without creating a security hole and host-based vulnerability scanning and compliance monitoring in multi-account scenarios. During workshops, Nathan could experiment and learn in a safe environment where he had no potential of breaking our production systems. All in all, the Lucid team made the most of their time in Vegas. We are already looking forward to sponsoring and attending AWS re:Invent next year and hope to make our engineering friends’ lives even easier when it comes to working visually inside and outside of AWS. Learn more about our AWS import from the video below, or sign up for your free account to try it out!